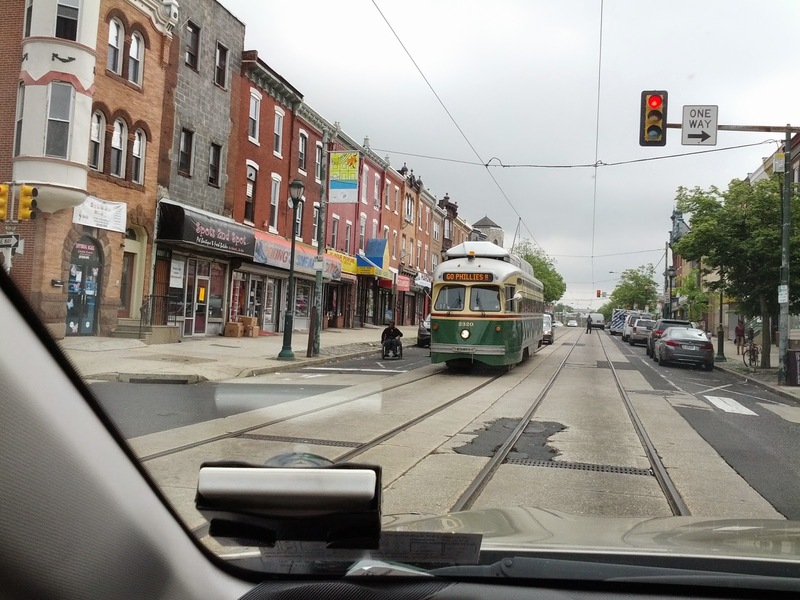 Philadelphia – The Girard Avenue streetcar is a nice “heritage” line, restored to service by SEPTA in 2005. Urban revitalization along Girard Avenue? Not so much. A lot more to be done (photo below). 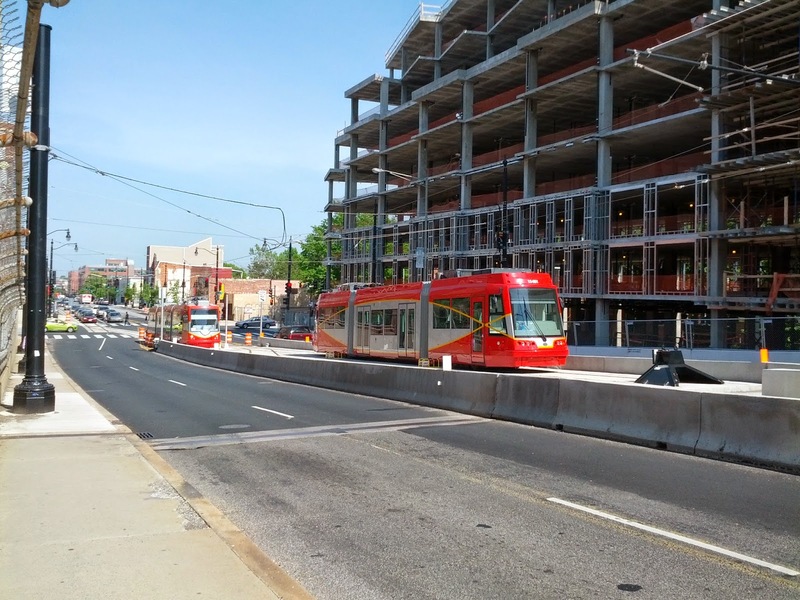 Washington – The new H Street line – the starter line for a 36-mile system (more here) – still doesn’t have a launch date (story here, photo of “parked” streetcars below). 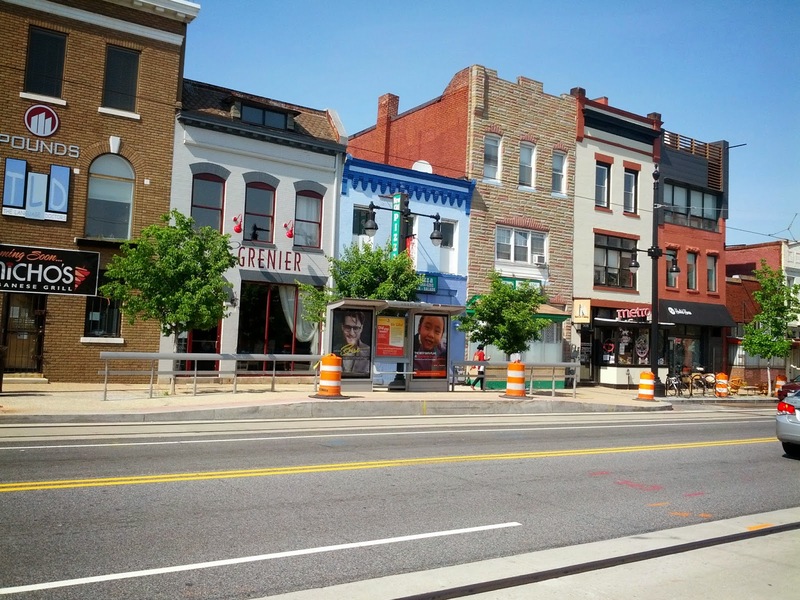 The good news is that H Street has been the object of a DC Great Streets initiative (link here), a multi-pronged, multi-agency revitalization initiative. And it shows (photo below)! Yes, there are plenty of rough edges, but also many signs of investment. Just need the streetcars to roll! The new National Climate Assessment report is bound to get lots of press attention, although whether it will have any impact on the Flat Earthers is doubtful. Transportation isn’t a leading topic of the report, but does get a chapter (available here), put together by a team led by Henry Schwartz and Mike Meyer. Most of this is pretty straightforward. Added Message 1: Redundancy and connectivity is really important. The report notes that a “network” approach to infrastructure is good, but this subject needs a higher profile. Simply filling in missing street grid and prohibiting future cul-de-sacs not only helps in emergency situations but also mitigates congestion and greenhouse gas emissions on an everyday basis. Added Message 2: We need better planning. Although the report says this too, I think it needs more emphasis. For example, one example provided of possible climate change impacts is the vulnerability of Mobile, Alabama to flooding. Interestingly, the last Alabama long-range transportation plan (admittedly due to be updated) outlines hurricane evacuation routes, but doesn’t mention climate change. Some long-range plans do a good job of at least attempting to grapple with climate change (see my comments on Maryland DOT’s plan here), but many don’t. Added Message 3: Prepare for the consequences of electrifying the transportation system. The report talks about changes in fuels, but the writers probably didn’t want to get into a fight about natural gas, hydrogen, etc. To me, it is pretty evident that pretty much the whole transportation system is going to need to be electrified, which will have all sorts of effects on adaptation. Added Message 4: Remember there are other changes going on. The report quotes old sources to warn about increasing VMT and freight movements. In fact, VMT has flattened out, demographic changes are affecting travel habits, and at least some manufacturing is being reshored. Added Message 5: We need to cope with the uncomfortable prospect that climate change adaptation will cause new conflicts between transportation agencies and environmental agencies. Engineers who design “all-weather” roads to serve as evacuation/emergency routes will likely look at more bridges, higher bridges, elevated causeways, and more impervious surfaces – all anathema to current environmental policies and regulations. Added Message 6: We need to think more about walkable/bikeable, resilient neighborhoods and towns, with “islanded” electric grids and local goods and services. When roads are closed, the main grid is down, and long-range travel is perilous, walking to a corner store with solar power will look like a pretty good option. So let’s hope the National Climate Assessment – and the President’s sales pitch – is effective in moving the nation toward better climate policies. And let’s expand the next Assessment to grapple with some of the issues I suggested.